In Mexico, paper mache rattles are popular during New Year's celebrations. The rattles are shaken to welcome the generous spirits of the new year and to drive away the unhappy spirits of past years. I have included a template version and a paper mache version of this craft. the template version is a lot quicker and the paper mache version is more "traditional". small rocks, dry beans or unpopped popcorn. Cover one end of the toilet paper roll with masking tape. 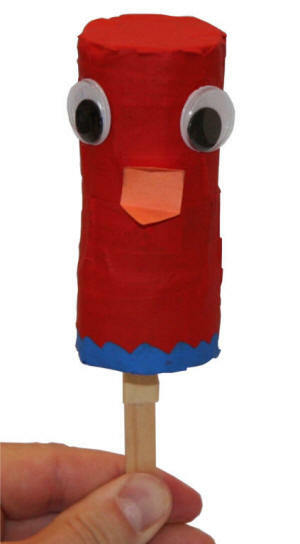 Suggestion from a viewer: "I had my students make the DLTK-Kids' Mexican Rattle Craft. We made the template version, and I made one modification. We made a small circle of paper and taped it over the toilet paper tube to keep the "rattle" materials from sticking to the masking tape." Insert the popsicle stick inside the other end of the toilet paper roll and tape it on firmly -- tape it lots! 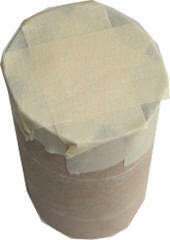 Put some rocks, beans or popcorn inside the toilet paper roll and cover the other end with masking tape. Fold the beak template piece in half and on the dotted line and glue to the center of the bird's head. Glue the eyes onto the face and the feathers onto the top of the head. For an extra firm handle, tape one popsicle stick inside the toilet paper roll and tape a second popsicle stick (overlapping the first) on the outside of the toilet paper roll. Then wrap some tape around the two sticks to make them into one stick. You'll be able to paper mache over top of all this. 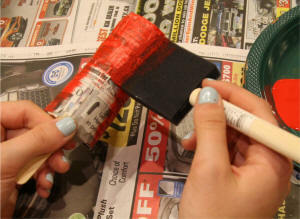 paper mache the toilet paper roll with 2 layers of newspaper, paper towel or toilet paper... The paper towel or toilet paper make a nice texture and I find them easier to paint. Glue wiggly eyes on the bird or you could use paint to make eyes if you prefer. 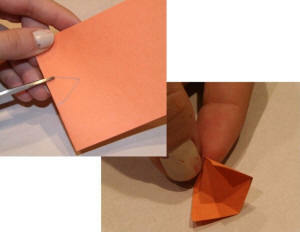 Use orange construction paper to make a beak (you can look at the template version for an idea of how to form the beak). Optional: Glue feathers onto the top of the bird's head.